When you create a practice you must select a Roster and Location. If you take attendance but no swimmers show and you have to tap the swimmer icon to select them, it's because your swimmers are not assigned to a Roster and/or Location. 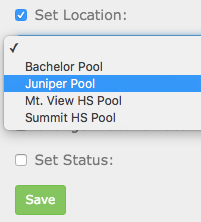 Even if you only have one location, you still need to assign all swimmers to one, even something generic like "Pool." You can fix this in SwimOffice. Our steps assume Location is the problem, but they are similar for Roster Groups. Click anyone's name to edit them. Scroll down to the Roster | Location | Billing Setup section. Click the Location dropdown. If you see one or more Locations, skip down to assigning members to a Location. Otherwise click the gear by the Location dropdown. Enter a Location Name in the field and click Save Record. Repeat for any additional locations. Scroll to the top and close the member window (click the big red X). Now assign members to a Location. If they are all in the same Location, select all (click checkbox by Last Name column header). 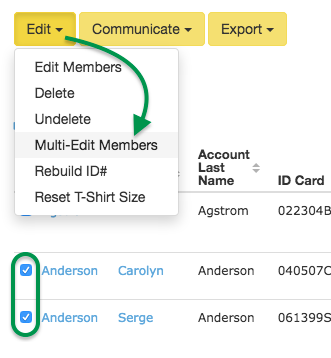 Otherwise you can click Customize Filters to narrow down the list and click column headers to sort, then select all those members in the same Location. Click Edit > Multi-Edit Members. Click Set Location and choose the desired Location. Repeat if other members need to be assigned to a different Location.